Line a baking dish with foil and baking / parchment paper. Mix together Sauce in a bowl. Place chicken in baking dish, skin side down for thighs and wings. Make sure the pan is big enough so the chicken is squished up next to each other (sauce may not reduce enough), but not so large that there is more than 4"/10 cm between every piece of chicken (sauce may reduce too much). Pour over Sauce. Bake 30 minutes. Turn chicken over, spoon over sauce. Bake 20 minutes or until chicken is cooked through. The Sauce should have thickened. Stand for 5 minutes, then spoon Sauce over chicken and serve. 1. You can use any of these cuts of chicken. I used 3 bone in thighs and 3 drumsticks in the photos. Normally I just use one or the other. If using frozen chicken, ensure it is thoroughly thawed, then pat dry before proceeding with recipe. Otherwise there will too much excess liquid and the sauce may not thicken. This recipe doesn't work with breast. Trust me, I've tried. Breast cooks in half the time, loads more juices comes out and there's no fat (which helps make the sauce nice and sticky). To make this with breast, you would be better off making the sauce separately. So sprinkle the breast with salt and pepper, baking for 25 minutes, then rest 5 minutes. Then I would double the sauce, place in saucepan over medium high, simmer rapidly until it reduces by over half to a syrup. You should end up with about 3/4 cup of balsamic reduction that you can spoon over the chicken. 2. To do this, just scoop up brown sugar and level it off. Don't pack it down into the cup then top with more sugar - if you do that, you will use about 30% more sugar. 3. SCALING: If you scale down, use a smaller baking dish. If you scale up, you need to use a larger dish. If the chicken is too snug and there's no space between them at all, then it affects how the sauce reduces and thickens. You don't need loads of space, just a bit - watch the video! 4. MARINATING: The sauce is quite intense flavoured (you wouldn't drink it!) so you don't need to marinate the chicken. You can marinate for up to 24 hours if you wish. Or freeze immediately after combining Sauce and chicken, then as it defrosts the chicken will marinate. 5. MAKE AHEAD / STORING / FREEZING: Reheats really well for up to 3 days. Just cool and refrigerate, then microwave to reheat (oven can make glaze burn). Cooked leftovers also freezes really well. See Note 4 for freezing marinated chicken. 6. 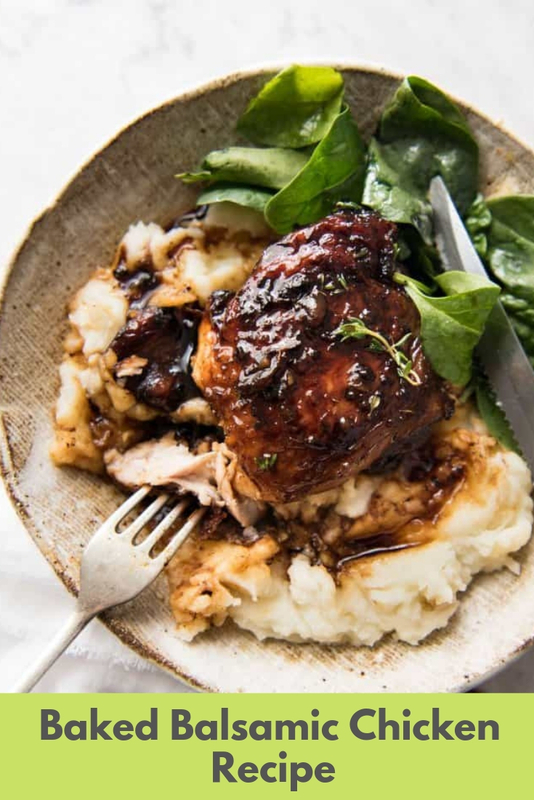 Baked Balsamic Chicken nutrition per serving, assuming 5 servings.